I try to begin Lent each year with a retreat, and this year I spent Ash Wednesday on a retreat in Saint Patrick’s College, Maynooth, when part of my retreat reading included Samuel Johnson’s novel Rasselas. Then, earlier this month, I had a few days back in Lichfield, with all the ingredients and benefits of a retreat, including time for prayer, for silences, for walks in the countryside, and for visits to a cathedral and a church that have played important roles in the development of my faith and my spirituality. Samuel Johnson often visited Ilam Hall in rural Staffordshire, on the edge of the Peak District, and went fishing at Dovedale, and these visits probably had the same value as retreats. A part of the grounds in Ilam is known as Paradise Walk, and it is said this valley inspired Johnson when he was writing Rasselas. This is the story of a fictional Abyssinian prince who lived in Happy Valley, and Johnson wrote the story hastily in 1759 to raise money for his mother who was seriously ill and to pay for her funeral. The story is far removed from the storyline in the BBC television drama series, Happy Valley, which takes its title from the name from local police give to the Calder Valley area in West Yorkshire because of its drug problems. Boswell would recall in biography of Johnson: Ilam has grandeur tempered with softness: the walker congratulates his own arrival at the place, and is grieved to think he must ever leave it. I spent a delightful few days in Ilam over 40 years ago when I was in my late teens. 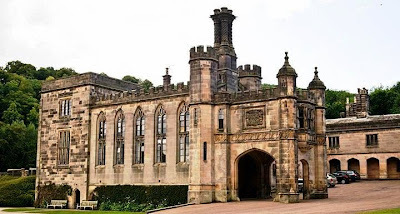 I had hitch-hiked from Lichfield, where I was staying, to Ashbourne and from there, following in the footsteps of Samuel Johnson, it was another four or five-mile walk to Ilam, where I stayed at Ilam Hall, which has a stately tale to tell but was then (and still is) a youth hostel. Out of his experiences in Ilam and Dovedale, Izaak Walton first published the The Compleat Angler in 1653, and he continued to add to it for a quarter of a century. There was a second edition in 1655, a third in 1661, a fourth in 1668 and a fifth in 1676. In this last edition the original 13 chapters had grown to 21, and a second part was added by his friend Charles Cotton. In the following century, an annotated edition of Izaak Walton’s Compleat Angler was published in 1760 by Sir John Hawkins (1719-1789). Hawkins was among Johnson’s closest friends and was an executor of Johnson’s will. His biography of Johnson, published with his 1787 edition of Johnson’s works, was superseded only by Boswell’s. To facilitate this change of our affections it is necessary that we weaken the temptations of the world, by retiring at certain seasons from it; for its influence arising only from its presence is much lessened when it becomes the object of solitary meditation. A constant residence amidst noise and pleasure inevitably obliterates the impressions of piety, and a frequent abstraction of ourselves into a state where this life, like the next, operates only upon the reason, will reinstate religion in its just authority, even without those irradiations from above, the hope of which I have no intention to withdraw from the sincere and the diligent. I was happy to hear my Dad was going fishing near his retirement home in Bromsgrove. Being present with Mother Nature and then catching a massive trout! "I threw it back in" he said, 'I don't like it'! Re: Lent - I left CofE at 11yrs, but I often walked with my friend to her RC church for her dutiful confession. I thought that going without/rations for so long was a bit OTT but it was probably more time spent as RC school, whereas I was secular. Did the Anglicans start to become less rigid over time? My research is 17th century so how would Lent fit if you are suffering from food shortages(even more than usual)? I understand the Puritans legislated for public fasts in a hungry population.